According to Rick Perlstein's recent book, we're all still living in Nixonland—as this DVD special edition comes out, we're finally in the last lap of the 2008 Presidential race, and surely we have Richard Nixon to blame, at least in part, for the noisy, childish, nanny nanny poo poo tenor of so much of our political debate. You�d think the life, the rises and many falls of perhaps the most hated politician of the second half of the twentieth century would be raw meat for Oliver Stone, our most political popular filmmaker, and in part you'd be right. 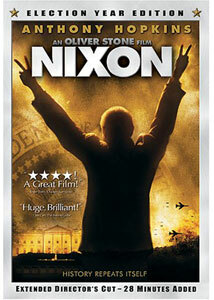 Stone tells Nixon's life as an American epic, and one that's at first blush surprisingly empathetic to its protagonist. But given that Stone has demonstrated on more than one occasion that he's unlikely of sound mind in his conspiratorial thinking (cf., JFK), one of the big disappointments about Nixon is that it isn't even more batshit crazy. We know how grand Stone is thinking from the jump, with a Biblical epigraph, somber, nearly funereal music from John Williams, and many shout outs to Citizen Kane—it's Richard Nixon's life as the seamy underbelly of American history, Richard Hofstadter's paranoid style in American politics incarnate. Nixon becomes our dark prince, and his foibles are continually on display—it's the President as a foul-mouthed inhabitant of his bunker, indulging in one more boozy, pill-popping pity party. The story isn't told in a linear manner, but is framed by Nixon listening to some of the most incriminating of the Oval Office tapes concerning the coverup of the Watergate break-in—he's lusted after the Presidency his whole life, and now he's watching it slip away. Stone's incomparable co-conspirator on this project is his cinematographer, Robert Richardson, who plays around with film stocks, exposures, lenses, making for a visually tantalizing and deeply compelling picture. And it had better be, because this cut of the film runs better than three and a half hours. It's odd, at first, to see Anthony Hopkins in the title role—a Welshman playing this son of California? And it's not really much of a physical impression of the man—he doesn't give himself over to the ghost, the way, say, Jamie Foxx seems to have done as Ray Charles. After a while, though, you go along, in part because you have to, in part because Hopkins is such an entrancing and theatrical actor, even if the accent work and the prosthetics can be inconsistent from scene to scene. The truly flabbergasting performance, though, is Joan Allen's, as Pat Nixon—aside from the physical resemblance being almost uncanny, it's that Allen gives a full-blooded portrayal to a woman who seemed always like a Stepford wife in her public appearances, plastic smile forever pasted onto her face, her eyes a step away from complete glazed over. Seeing Pat Nixon as a human being and not merely an automaton may be this movie's greatest triumph. Nixon was a public figure for so long that even a film of this length has to gallop through a whole lot of history, but if you remember the Nixon presidency—that is, if, like me, you are old—there's treat after treat in the casting of characters familiar from another time. David Hyde Pierce is just perfect as a young John Dean, with James Woods and J.T. Walsh oozing smarminess and evil as Haldeman and Ehrlichman respectively; Paul Sorvino is criminally underutilized as Henry Kissinger, though it's a sprightly, small performance, Dr. K as a Teutonic, Harvardian take on Big Paulie. Ed Harris makes for a great Howard Hunt, ringleader of the Watergate burglars; Madeline Kahn is a fantastically daffy Martha Mitchell. There are a couple of overly broad strokes, though, like J. Edgar Hoover and Clyde Tolson as a couple of pauncy old queens. Some of the most memorable stuff, actually, is in the small moments, the psychological profile of the man. The Nixons' seems to have been a very strange marriage, and here they sometimes go at it like George and Martha; even more disconcerting is Nixon's sense of himself as a historical figure, his sense that he's created something that's out of even his control. After the Kent State massacre, for instance, he seems to separate the man from the President: "I'd like to offer my condolences. But Nixon can't." The film excels in its faithful re-creations of iconic events, like the famous 1962 last press conference, or Nixon's final farewell to the White House staff after his resignation. But a lot of this can be oddly cartoony and two-dimensional, and at some point you can't quite believe how long the movie is allowed to go on—it's almost like Stone thinks that if he can keep at it long enough, he'll get to the heart of the man. But movies don't work that way, and neither do biographies—what, ultimately, does the Rosebud revelation reveal to us about Charles Foster Kane? Perhaps it's our mistake in thinking that there's a secret to Nixon; he's certainly a character without much self-awareness by the end of his days. No doubt his legacy endures, however, for good and for ill; this movie makes for an odd overview of the man and his times, with particular fascinations if you remember much of this. Image Transfer Review: Richardson's work is very well rendered; the palette veers to the dark side, as you might expect with anything Nixonian, so the care taken with the black levels is especially appreciated. Audio Transfer Review: Williams' score is frequently obvious and overly ominous; it's an aggressive audio mix, so having surround speakers is invaluable for this one. Extras Review: Yes, it's Oliver Stone, by himself, on not one but *two* commentary tracks—like much else about this movie, it seems like a bit of a mad indulgence, and there's just not seven hours of substance here to make it worthwhile, especially when you think that they could have been combined for a single killer track. Anyway, the A track focuses on the filmmaking, acknowledging the debt to Kane and discussing individual performances; the B track focuses more on the historical circumstances, and their necessary compression and telescoping for the screen. You can�t help but wish that Stone had either prepared more, or brought along some of his colleagues or historians or those portrayed in the film to expand the conversation, or all of the above. The second disc starts with a package of ten deleted scenes, with an introduction and concluding remarks from Stone—he remains grand in discussing his influences, here adding Eisenstein and D. W. Griffith to his short list, and telling us that the first cut added yet another 45 minutes to the running time. Calling these deleted scenes is a bit of a misnomer, actually, as mostly what's here are expanded versions of scenes that you'll see in the feature. Beyond Nixon (35m:16s) is an assessment of Nixon as a historical figure, with a couple of academics, John Dean now in elder statesman mode, Gore Vidal, former Congresswoman Elizabeth Holtzman, and columnist Robert Novak—the last even gives Stone's movie a review: "I was sickened by it." (Shocking!) Finally, Stone discusses this film and offers a bit of a career retrospective in an episode of The Charlie Rose Show (55m:10s) on which he was the sole guest. An extraordinarily ambitious film that tests the capacity of movies to be faithful to history. Oliver Stone isn't always much for the facts, but he's certainly a showman, and his empathetic portrait of an improbably powerful man whose steep decline will forever be a dark chapter in America's story makes for a crammed and occasionally overcrowded motion picture.